41 w w w . M o d e r n T i r e D e a l e r . c o m know what a ball joint is." e problem was those employees had no experience in the bays. e MIT program is designed for "future leaders of the company." One participant had earned a Master's Degree in Business Administration. Another was a trained engineer. "We recruited them and sold them on our business." But they had no automotive experience. MIT participants spend 90 days working in the Tate Boys quick lube lanes, six months in the tire lanes, and another 90 days alongside the company's technicians. "It's worked out well. ree of our store managers have graduated from that pro- gram," Tate said. e result is that those store managers are great tire changers who understand what needs to happen in the bays to make the business operate efficiently and profitably. e participants are paid at a higher grade than the jobs they're assigned to in the shop, but Tate said the store where they're assigned doesn't have to cover their full salary. e extra pay is assigned to the corporate payroll, while the store has to cover the portion that would have been paid to a tire technician or quick lube technician. 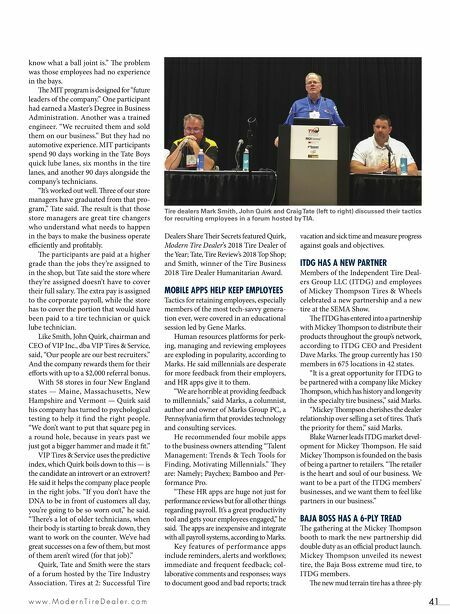 Like Smith, John Quirk, chairman and CEO of VIP Inc., dba VIP Tires & Service, said, "Our people are our best recruiters." And the company rewards them for their efforts with up to a $2,000 referral bonus. With 58 stores in four New England states — Maine, Massachusetts, New Hampshire and Vermont — Quirk said his company has turned to psychological testing to help it find the right people. "We don't want to put that square peg in a round hole, because in years past we just got a bigger hammer and made it fit." VIP Tires & Service uses the predictive index, which Quirk boils down to this — is the candidate an introvert or an extrovert? He said it helps the company place people in the right jobs. "If you don't have the DNA to be in front of customers all day, you're going to be so worn out," he said. "ere's a lot of older technicians, when their body is starting to break down, they want to work on the counter. We've had great successes on a few of them, but most of them aren't wired (for that job)." Quirk, Tate and Smith were the stars of a forum hosted by the Tire Industry Association. Tires at 2: Successful Tire Dealers Share eir Secrets featured Quirk, Modern Tire Dealer's 2018 Tire Dealer of the Year; Tate, Tire Review's 2018 Top Shop; and Smith, winner of the Tire Business 2018 Tire Dealer Humanitarian Award. MOBILE APPS HELP KEEP EMPLOYEES Tactics for retaining employees, especially members of the most tech-savvy genera- tion ever, were covered in an educational session led by Gene Marks. Human resources platforms for perk- ing, managing and reviewing employees are exploding in popularity, according to Marks. He said millennials are desperate for more feedback from their employers, and HR apps give it to them. "We are horrible at providing feedback to millennials," said Marks, a columnist, author and owner of Marks Group PC, a Pennsylvania firm that provides technology and consulting services. He recommended four mobile apps to the business owners attending "Talent Management: Trends & Tech Tools for Finding, Motivating Millennials." ey are: Namely; Paychex; Bamboo and Per- formance Pro. "ese HR apps are huge not just for performance reviews but for all other things regarding payroll. It's a great productivity tool and gets your employees engaged," he said. e apps are inexpensive and integrate with all payroll systems, according to Marks. Key features of performance apps include reminders, alerts and workflows; immediate and frequent feedback; col- laborative comments and responses; ways to document good and bad reports; track vacation and sick time and measure progress against goals and objectives. 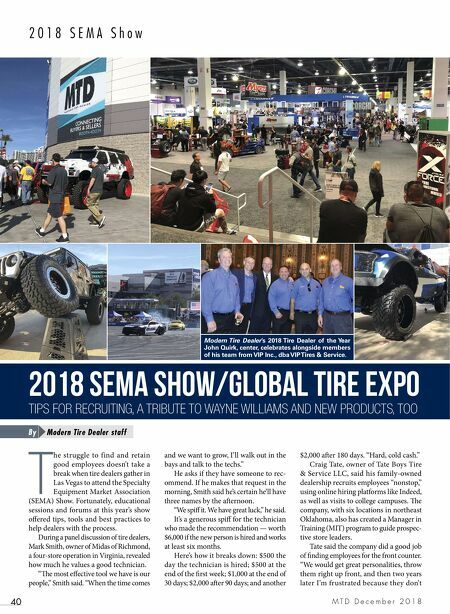 ITDG HAS A NEW PARTNER Members of the Independent Tire Deal- ers Group LLC (ITDG) and employees of Mickey Thompson Tires & Wheels celebrated a new partnership and a new tire at the SEMA Show. e ITDG has entered into a partnership with Mickey ompson to distribute their products throughout the group's network, according to ITDG CEO and President Dave Marks. e group currently has 150 members in 675 locations in 42 states. "It is a great opportunity for ITDG to be partnered with a company like Mickey ompson, which has history and longevity in the specialty tire business," said Marks. "Mickey ompson cherishes the dealer relationship over selling a set of tires. at's the priority for them," said Marks. Blake Warner leads ITDG market devel- opment for Mickey ompson. He said Mickey ompson is founded on the basis of being a partner to retailers. "e retailer is the heart and soul of our business. We want to be a part of the ITDG members' businesses, and we want them to feel like partners in our business." BAJA BOSS HAS A 6-PLY TREAD e gathering at the Mickey ompson booth to mark the new partnership did double duty as an official product launch. Mickey ompson unveiled its newest tire, the Baja Boss extreme mud tire, to ITDG members. e new mud terrain tire has a three-ply Tire dealers Mark Smith, John Quirk and Craig Tate (left to right) discussed their tactics for recruiting employees in a forum hosted by TIA.